As you know we're a discount art store and offer everyday savings. In order to show how much we appreciate your support, we'd like to provide you with even BIGGER SAVINGS ALL YEAR ROUND!! To accomplish this, we'll be running weekly sale specials on select brands throughout the store. Holbein Paints- 50% off list! Fredrix Stretched Canvas- 50% off list! 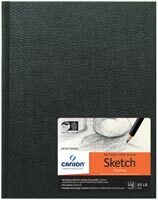 Canson Hardbound Sketchbook 8.5x11- was $17.35, NOW $8!